The play is in two acts. In act one, we meet our protagonist Mr Thomas Gradgrind (played by Andrew Price), a wealthy, retired merchant who devotes his life to a philosophy of rationalism, self-interest, and fact. Price delivers his stoic role believably and with pathos, for what could have been quite a stereotypical characterisation. Mr Gradgrind is raising his eldest children, Louisa (Vanessa Schofield) and Tom (Perry Moore), according to this philosophy and never allowing them to engage in fanciful or imaginative pursuits. Schofield and Moore’s representation of the sibling affection was a joy to watch on stage and their rapport with one another really helped us to understand their broken relationship in act two. Gradgrind charitably takes in one of the children from a travelling circus after the disappearance of thier father, a circus entertainer. Gradgrind vows to educate her like his own children. The kindly and imaginative Sissy Jupe, playfully portrayed by Suzanne Ahmet, brings a light relief to the sombre home of the Gradgrind family. But can Mr Gradgrind change the emotionally intelligent Sissy to mould her into the fact finding, book reading specimen his own children have become? The script, which follows the original novel with precision, tells the story very simply and made the performance accessible for young and old audience members. Writer Deborah McAndrew is a regular writer for Northern Broadsides and clearly understands their style of performance as the scenes and dialogue seemed to blend effortlessly to tell this often cumbersome and dark story, with a sense of energy I wouldn’t have expected from Dickens on stage. McAndrews has a long list of plays she has written, and performed in with Northern Broadsides since 2004 which includes her play ‘An August Bank Holiday Lark’, which won her Best new play twice in 2014 at the UK and then Manchester Theatre Awards. Northern Broadsides is a Northern theatre company with a plethora of productions under their belt in the north and touring across the country. Their energetic style was brought to this production using circus acts; juggling, uni-cycling, fire and live music. These were definitely my favourite moments of the play and I found myself longing for more. The acoustic of the brass band gave a warm northern edge to the performance and the lively choreography of the circus performers was so entertaining, it left the audience in anticipation of when it would next appear. I particularly liked the use of the circus to show the passing of time with the Gradgrind children, a poignant moment. The designer Dawn Allsopp created a marvellously imposing Victorian mill which remained static throughout but glimpses of the circus tent inside the doors were symbolic of the constant threat of imagination and creativity to the Gradgrind house. It was a simple yet very effective feature. The overhanging industrial machinery looked fantastic and I was excited to see how it would be integrated into the performance but sadly this moment did not arrive. Other notable features of the design were the wonderful costumes by the creative costume team made up of Lucy Archbould and her Wardrobe Interns Sarah Lillie Rose and Sarah-Jayne Bell. The vibrant array of colour in the costumes was really striking against the murky brick work of the mill. This was a thoroughly entertaining performance which I enjoyed from start to finish. 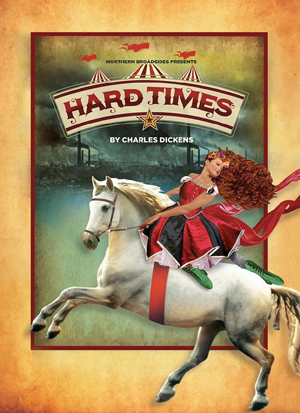 Hard Times will run until Saturday 10th March at the Quays theatre, Salford.